The nutritional requirement for the growing children is slightly different from the adults. As the children are always physically very active, their bodies require higher amounts of proteins, carbohydrates, fats along with vitamins and minerals and calcium as compared to adults. Children must consume a well balanced diet which can fulfill their nutritional demands. In this blog we will discuss about 7 super foods which every child must consume to remain active and healthy. Superfoods are the foods which are packed with loads of vitamins, minerals and antioxidants. Eating even a small portion of such food everyday proves beneficial for the body. 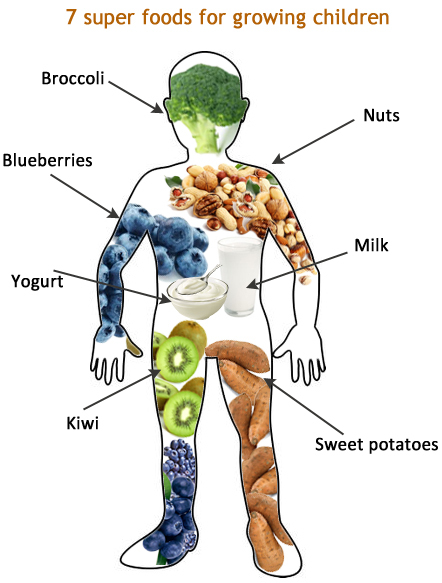 Here is the list of 7 super foods recommended for the growing children. Kiwi: Kiwis are full of antioxidants, fibers and Vitamin C. Kiwi contains the highest amount of Vitamin C than other citrus fruits. It also contains Vitamin A and potassium which is not found in every fruit. Eating just one Kiwi ensures your body gets the required amount of Vitamin c and other micro nutrients. Broccoli: Broccoli is a favorite vegetable used in salads. It can be consumed raw as well as after cooking. It contains a large amount of fibres, Vitamin C and high amount of Vitamin A which is very useful for the eyes of the growing children. Since it contains lots of fibers it can be useful for those who are on diet and want to lose weight. One can make different dishes of broccoli by steaming, roasting, grilling or even stir frying it. Milk:Milk is the very important source of calcium, phosphorous and proteins. It is very essential to keep the bones, teeth and nails of the children healthy and growing. Milk is also rich source of Vitamin D. Sometimes children show strong aversion to drink milk. They refuse to drink however hard you try. Such fussy children should be made to eat milk products like cheese, yogurts and cottage cheese etc. Yogurt:Just like milk, yogurt also contains high amount of calcium and proteins. Yogurt is very helpful in boosting up the immunity and keeping the digestion in a good shape. Regular consumption of yogurt is recommended to fight the harmful bacteria present in the gut. Sweet potatoes:Sweet potatoes are very high in fibers and carotenoids. They also contain a large amount of beta carotene, calcium and potassium. The natural sweet taste of the sweet potato makes it favorite among the children and adults equally. One can make many delicious dishes out of sweet potatoes or it can be simply steamed and eaten hot. Nuts: All kinds of nuts are extremely useful for children because they contain high amount of essential fatty acids like Omega 3 fatty acids and proteins and Vitamin E. Nuts like almonds and walnuts are known to increase the memory power in the growing children. Other useful nuts are pistachios, peanuts and cashew nuts. Children should be made to eat peanut butter in sandwiches and pizzas because of its nutritional power. Blueberries: All kinds of berries are very good source of antioxidants. But blueberries top the chart. They are known to increase the immunity in the children and provide rare micronutrients like selenium and manganese. These micronutrients are important for keeping the bones strong and healthy. The high concentration of Vitamin C in blue berries help to fight the viral and bacterial infections and increase the immunity of the body. Children can consume blueberries as a fruit or sprinkle them on different deserts and fruit pizzas. Blueberry jam and syrups are also easily available in market. This is all about the seven super foods in growing children. Moms can fix up one super food for each day of the week. This will ensure that the child gets to eat one super food every day. This will ensure regular consumption of variety of super foods by the young ones.